Inside her studio workshop, Julie Monroe casts a glance at her handmade silver jewelry pieces and pays particular attention to the rocks and minerals used in her various pieces. 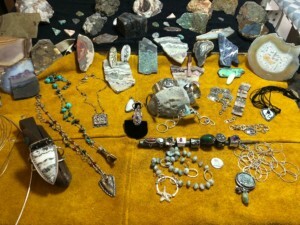 For this Ranch resident, jewelry making is more than a hobby — it’s a passion. Reviving the lost art of silversmithing, Studio Jules Silversmith has been in existence for a little more than a decade. When Monroe and her husband sold their company in 2009, she knew it was a fantastic opportunity for her to delve into jewelry making entirely. She had dabbled in it from time to time but couldn’t immerse herself in it when operating their business. Monroe said it always intrigued her how silversmithing originated many years ago. When Monroe first started her jewelry-making quest, she said she made cute silver pieces but admitted she couldn’t solder yet. “I could cut out silver, and I could, what we call, cold connect, which is using rivets and wires and different things to hold pieces together,” Monroe said. Since that time, Monroe has come a long way. She was first self-taught and then ventured off by taking a forging class. Now, Monroe uses a torch. After selling the family company, Monroe decided it was time for schooling and attended the regarded John C. Campbell Folk School not too far from her former residence in Asheville, North Carolina. She took comprehensive courses where she had concentrated and perfected her skills in silversmithing. 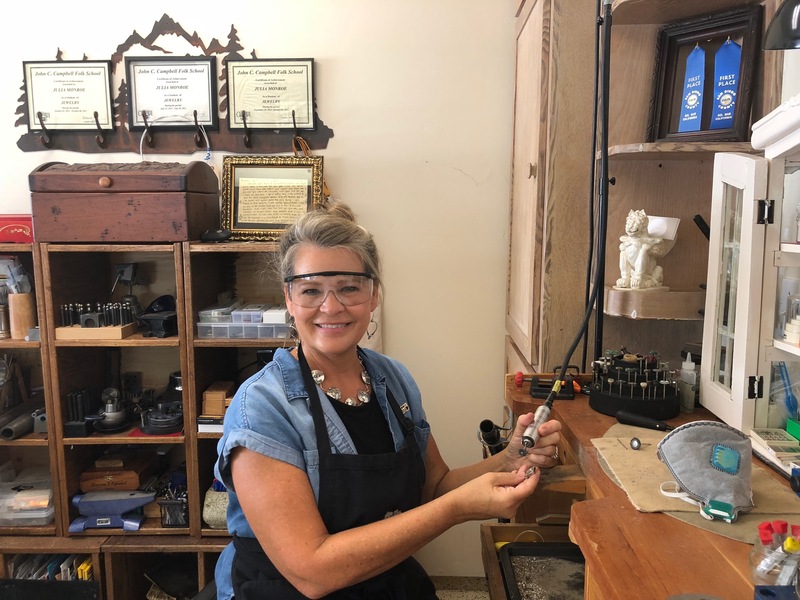 When Monroe and her husband moved to Rancho Santa Fe in 2014, she knew she wanted to get into the art community and decided to learn how to make cabochons at the San Diego Mineral and Gem Society. “It was a very desirable place to learn,” she said. When Monroe was bumped up to the advanced class, she was asked by her instructor Dennis Turner to teach his beginning class while he was overseas for a few months. “For a three-and-a-half month span of time I got to teach the beginners, and it was incredible,” Monroe shared. Monroe loved the teaching aspect of it all that she decided to branch off into accepting private students into her studio. Handcrafted jewelry means just that to Monroe. She makes everything by hand, including jump rings and clasps. Now, Monroe even makes her stones. She used to buy them, and now she cabs them. Monroe shared that her favorite part of creating jewelry is the process of it all. She remembers like it was yesterday driving around with her daughter a few years ago and having to pull over to scribble down a design that popped into her mind. Even with a rough draft diagram, Monroe said she could visualize the finished piece. And that’s the challenge — creating what she conceptualized in the first place. Monroe is thrilled with the fact that she has the rare opportunity to make beautiful pieces of jewelry for people. For more information about private classes and custom work, Monroe can be reached at studiojulessilversmith@gmail.com or (828) 545-5299. Potential students and clients can follow Monroe on Facebook and Instagram at studiojulessilversmith. Julie, you are a Super Star in silversmithing! And mostly self-taught! You have such talent that is just bursting to come out! You Go Girl!! I’m so proud of you and in awe of your skills! I know from experience that Julie Monroe is as beautiful inside and out as her exquisite designs. For jewelry that will be totally unique and soul inspiring THIS is where to look!